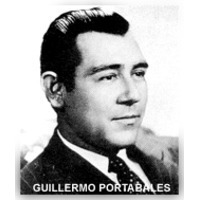 Guillermo Portabales (born José Guillermo Quesada Castillo, Rodas, Cuba, 6 April 1911 – San Juan, Puerto Rico, 25 October 1970) was a Cuban singer-songwriter and guitarist who popularized the guajira style of Cuban music from the 1930s through the 1960s. His languid, melancholy, intensely lyrical guajiras and his elegant, stylish singing made him popular throughout Latin America, where he is still revered. His birthplace was Rodas in the old province of Santa Clara (Las Villas). In what is now the Province of Cienfuegos. He grew up in Cienfuegos. His father died when he was about 8 years old, his mother then remarried a man whose last name was Portabales (the director of the Hospital in Cienfuegos), thus where his "stage name" came from. As for his birthdate, Helio Orovio, in the original Cuban edition of 1981, left Portabales out entirely. In the usual Soviet-style way, any opponents of the revolution get 'painted out' of history; but Portabales had left Cuba years before the Castro revolution, and most such people still retained their place in official Cuban history. Portabales had even recorded an album for Gema in Cuba in 1960, after the revolution but before Egrem took over all recording rights in Cuba. The later English translation reinstated such 'enemies of the state' as Celia Cruz (who was a determined opponent of the regime) and Portabales, giving 6 April 1914 as his date of birth. Cristobal Díaz Ayala gives 6 April 1911. The date and place of his death also vary in sources. Orovio's English edition says 1961. This is definitely incorrect, because there are at least three recording session whose dates are later in the 1960s: in 1962/3 in Miami; in 1967/8 in New York, issued on Gema 3070 Viva Portabales; and, above all, in October 1970 in Puerto Rico, just a few days before his death (issued Gema 3086 Sones cubanos: Guillermo Portabales con Los Guaracheros de Oriente). This simple refutation throws doubt upon Orovio's other data, and has led to a general acceptance of Cristobal Díaz's version of 25 October 1970.